- Visit Seven Sleepers Cave, tombs of Bilal bin Rabah & Abdul-Rahman bin Auf. - Morning pick up to visit tombs of Abu Ubaydah bin Al Jarrah & Muath bin Jabal. - Continue to Amr bin Abi Waqqas tomb & cave of Prophet Lot (PBUH). Day 3: Madaba, Mt. Nebo & Kerak. - Visit Abu Dharr Al Ghafari tomb & the Shrine of Prophet Noah (PBUH). - Check in Kerak hotel for overnight stay. - Visit the Shrines of Prophets Dawud & Prophet Sulayman (PBUH). - Visit Jaafar bin Abi Taleb, Zaid bin Haritha, Abdullah bin Rawahah tombs. - Afternoon transfer to Amman hotel for check in & overnight. - Visit Abu Al Dardaa tomb, Shrine of Prophet Hud & cave of Prophet Isa (PBUH). - Breakfast then drive to Jerusalem with a stop at Nabi Musa. 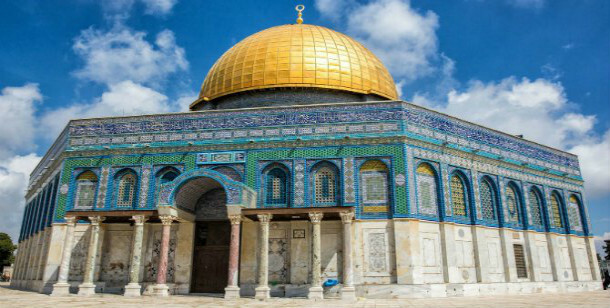 - Visit Al Aksa, Dome of the Rock, Mt. Zion & Nebi Daoud Tomb. - Visit the tomb of Mariam, Suleiman el Farsi & Rabah el Adawia. - Dinner and overnight in Jerusalem hotel. - Breakfast then visit Bethlehem, Hebron & Ibrahimi Mosque. - Drive to Amman airport for your flight back home.